Jim Bentley applauds the travelling Morecambe fans at the end of the Exeter game. Morecambe boss Jim Bentley says a first Football League win over Accrington Stanley is the perfect way for his side to end their home woes. The Shrimps have lost their last four home games and haven’t beaten their Lancashire rivals in League 2 in 15 attempts. Whether we meet at Morecambe High and get the coach to the Globe to do something to try and break the cycle I don’t know! Bentley’s side are in fine form on the road however and want to replicate their performances away from home when John Coleman’s Stanley visit the Globe Arena on Good Friday. The Shrimps boss, who saw his side draw 1-1 at Exeter on Saturday, said: “Our away form has been superb. “It’s up to me and the group to make sure we give our home fans something to shout about. “That’s where we need to excite. We’re creating chances and scoring goals away and we need to replicate that on home soil. “Nothing’s different. Whether we meet at Morecambe High and get the coach to the Globe to do something to try and break the cycle I don’t know! “We’ve lost the last four at home which is disappointing but there’s no better team to bounce back against than Accrington Stanley. Bentley’s big decision for the game will be in goal. 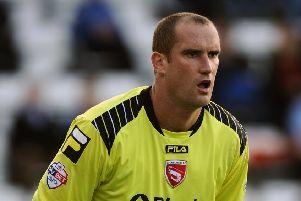 Andreas Arestidou returned between the sticks against Exeter after suspension with Liverpool loanee Danny Ward on international duty with Wales. Both are now available however. There will also be interest in the Accrington goal with former Shrimp Scott Davies currently acting as their eighth goalkeeper of the season after joining on loan from Fleetwood.